Give your loved ones a night of luxury this New Year! 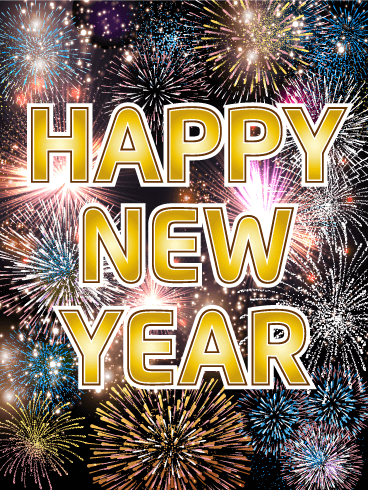 Champagne bubbles exploding from a rhinestone bottle sets up a party fit for a top class celebrity, so your friends and family will feel like a movie star when you send them this New Year card. Let them know you think they made the A-list and help them celebrate like a high-roller. 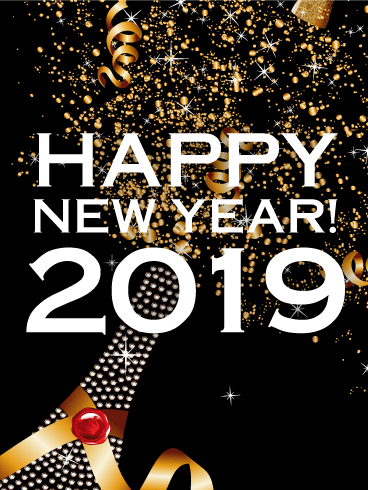 Bedazzle everyone's 2019! Each facet of these champagne classes refract a different color, a different memory of all the good times you had in 2018. 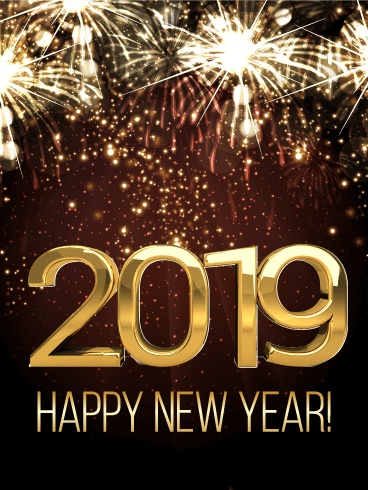 Now, it's time to drink to their fulfillment and get ready to fill 2019 with fantastic memories they will remember forever. Last year was a kaleidoscope of happiness, and this New Year card will let them know you'll make the New Year brighter! Do you have a glamour-loving diva in your life? 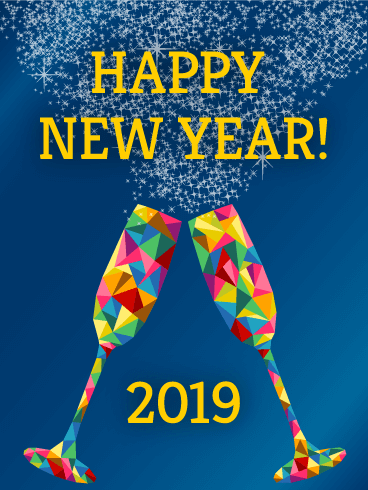 Send them this sparkling golden Happy New Year card to ring in 2019! The gorgeous golden background glitters and shines with stars, spots, and sparks of light. 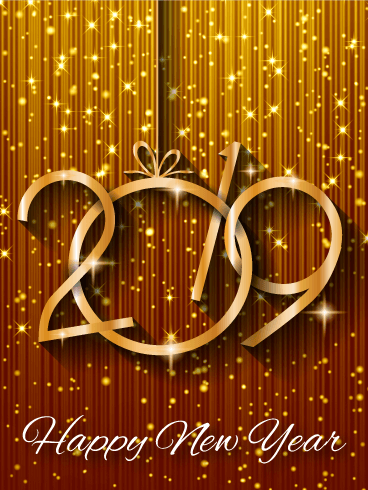 "2019" looks like it is cut out of paper, hole-punched, and hung with string from the top of the card. Underneath, "Happy New Year" celebrates the holiday for the fashionista in your life! 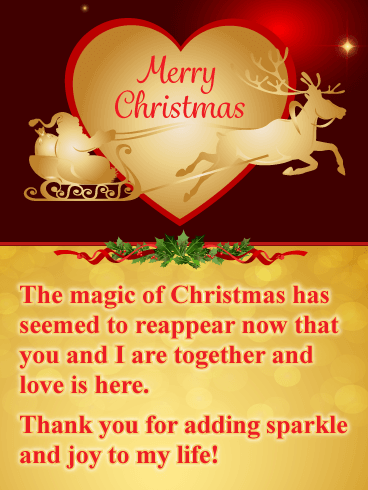 Send shimmer and shine with this luxurious Christmas card. 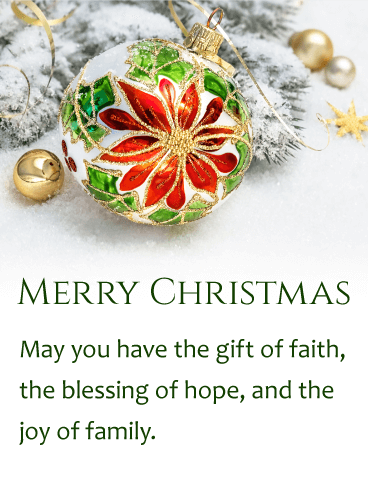 A beautiful poinsettia decorates the Christmas ornament in a snowy winter scene that wishes the receiver the gift of faith, blessing of hope, and joy of family. This thoughtful holiday greeting comes straight from the heart. 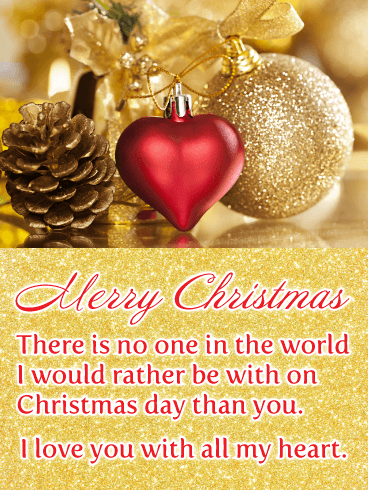 Wish a merry Christmas with a decorative holiday card to someone you hold dear. 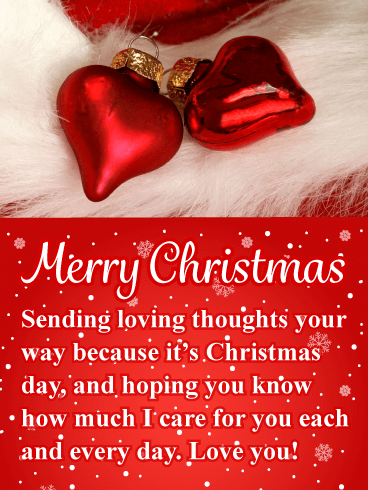 Make their day merry and bright when you send this Christmas card filled with warm wishes. Give love. Spread joy. Speak peace. 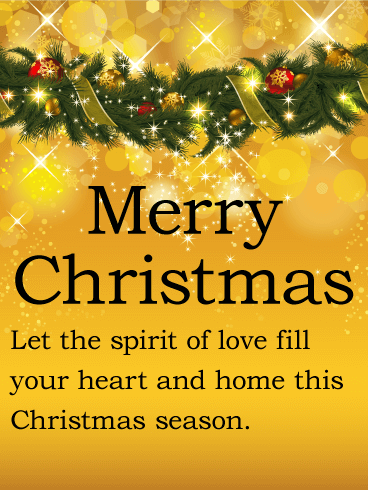 Christmas is a joyous season where we put our faith in each other and believe in miracles. This scenic and beautiful holiday card wishes the receiver a Christmas season that brings joy and happiness all year round. The snow falls gently down on the homes lit up by holiday lights. It's a perfect winter scene that captures the beauty of Christmas. 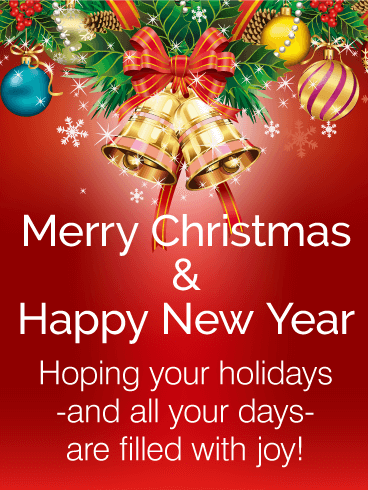 Holiday cards are the best way to celebrate Christmas, the end of the old year, and the start of the New Year. 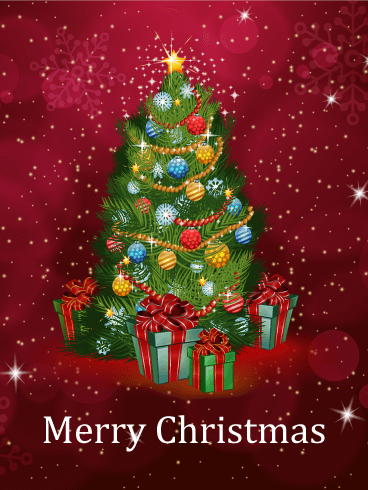 This Christmas card has a red background and a collection of shining Christmas decorations, including boughs of holly, pine cones, snowflakes, golden bells, red and gold ribbons, and blue, yellow, gold, and striped ornaments, at the top. 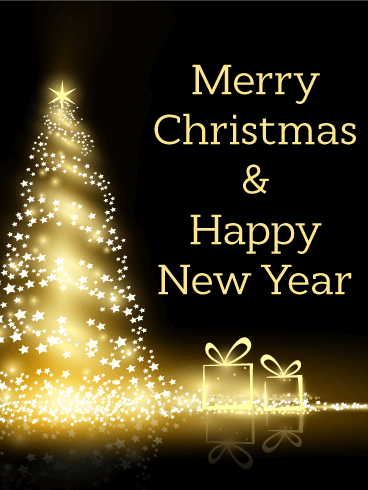 "Merry Christmas & Happy New Year - Hoping your holidays -and all your days- are filled with joy!" is written at the bottom. This card just screams Christmas. 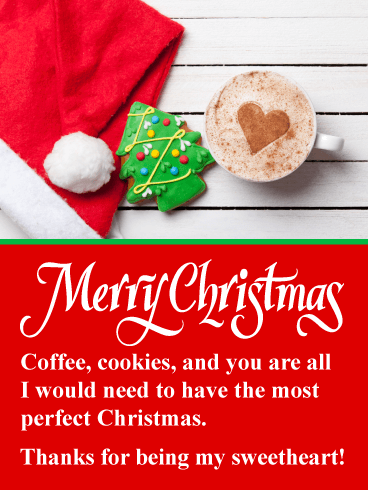 After all, the image of Santa in his sleigh is iconic and the story is told every year in multiple forms, from famous TV specials to a very famous poem. You may be an adult now, but I'm sure you'd still be excited on Christmas night if you heard a clatter on your roof. 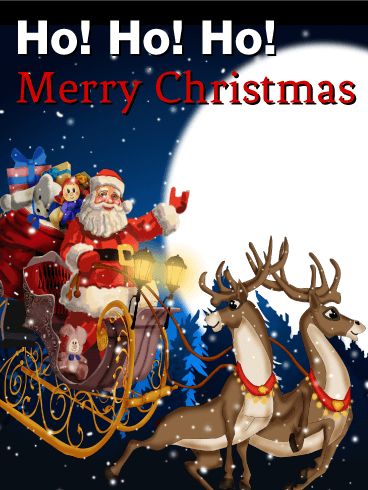 That's all part of the magic of Christmas, which you can share by sending this Christmas card. 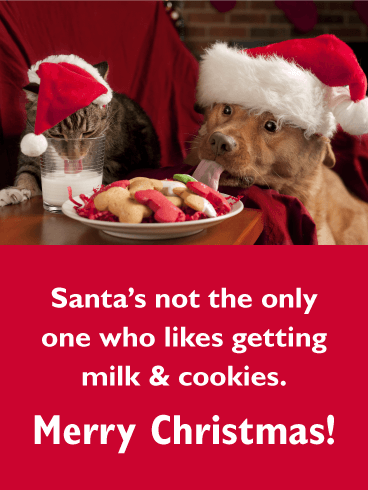 Meowy Christmas to you and yours! 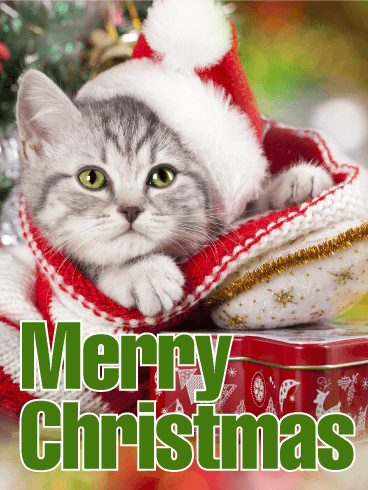 Let the adorable, fuzzy gray kitten on this Santa Cat Christmas Card send your holiday wishes this season. This Christmas cat is wearing a fluffy Santa hat as she nestles in a red and white knit stocking and the Christmas tin underneath is surely full of yummy Christmas cookies to share! 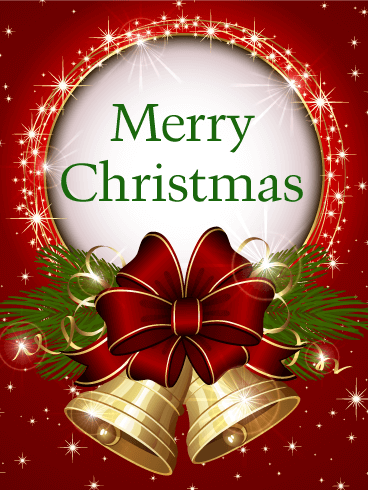 Use the cheery green message on this card to say "Merry Christmas" to your loved ones! Puppies make everything better! 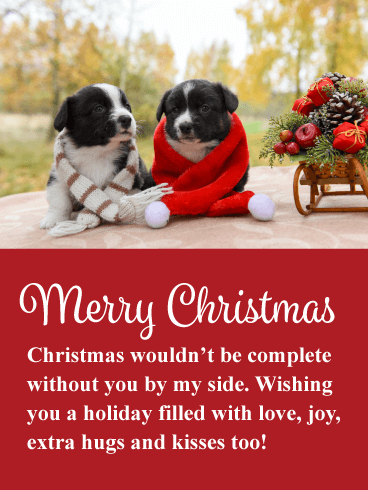 Send your paw-liday greetings with this Santa Puppies Christmas Card! 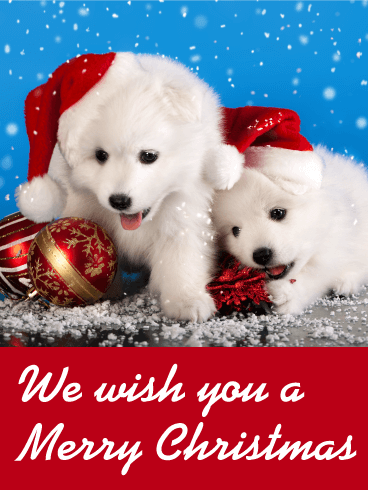 The two fluffy white puppies wear charming red Santa hats as they rest on the snow-covered ground and play with red, gold, and white ornaments. The bright blue background and fresh falling snow finish this adorable scene. 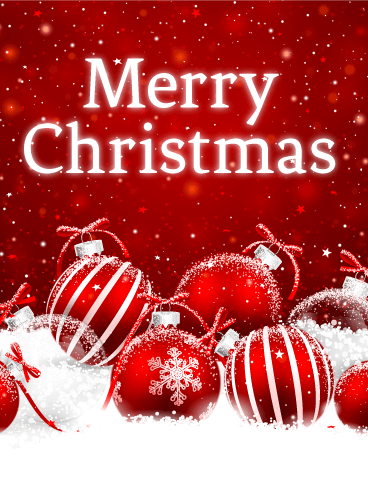 Say "We wish you a Merry Christmas" with this Christmas card today! Here comes Santa Clause, ready to deliver his gifts to the good boys and girls around the world! 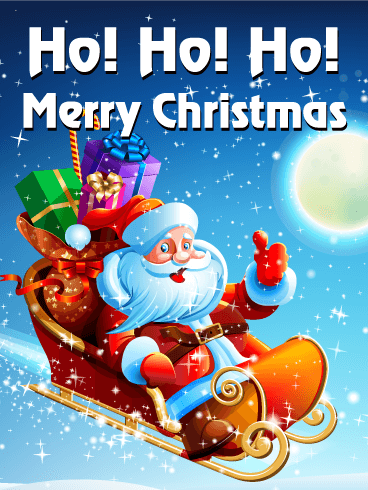 On this colorful Christmas card, Santa flies through the air on his magical sled, loaded with brightly wrapped presents for people everywhere! Let Jolly Old St. Nick say "Ho! Ho! Ho! 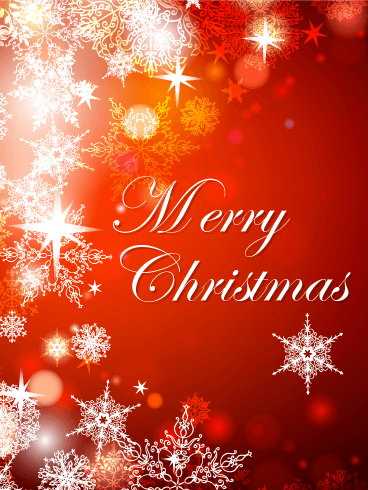 Merry Christmas" to your family, friends, and coworkers through this cheer-filled Christmas greeting! Nothing says Merry Christmas better than a gorgeous powder snow. This Christmas card showcases cheery red ornaments with stripes and snowflakes, dusted with a fine layer of Christmas snow. The red background glimmers with stars and snowflakes, happily proclaiming the start of Christmas! 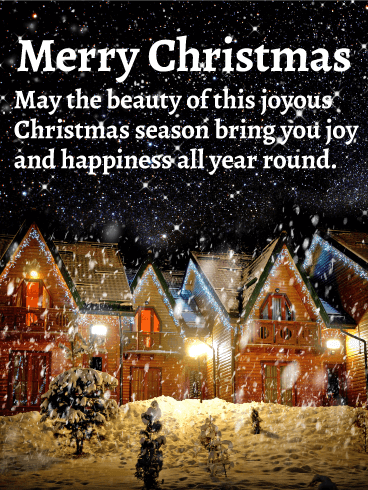 Share this Christmas card with your loved ones and spread the magic of a white Christmas, no matter the weather! Silver bells are ringing, it's Christmas time in the city! Ring in the holidays with this beautifully classic Christmas card! 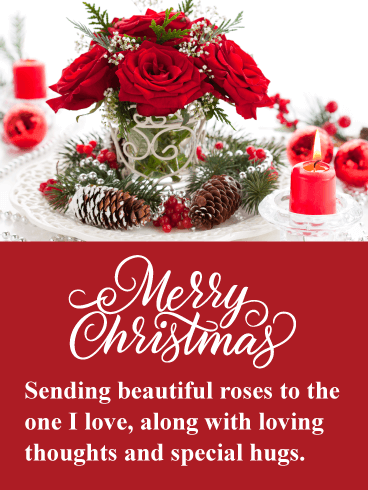 Adorned with boughs of holly and a charming red bow, these shining Christmas bells are the perfect way to say "Merry Christmas" to your loved ones. Let the red and green colors of the holiday, paired with the golden light of Christmas stars, show your Christmas spirit and cheer! Celebrate the holidays with this shining golden Christmas card! 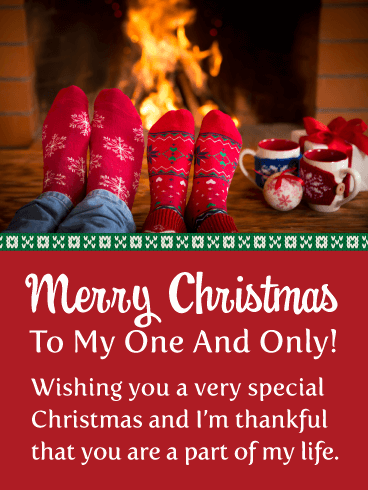 Say "Merry Christmas & Happy New Year" with a Christmas card that says it all. Shining red ornaments and golden ribbons celebrate the joy of Christmas, while the champagne colored background and sparkling stars ring in the start of a grand New Year! 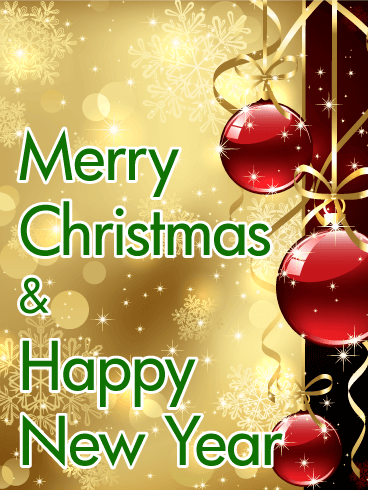 Send your holiday greeting and wishes for a happy New Year with one delightful Christmas card! 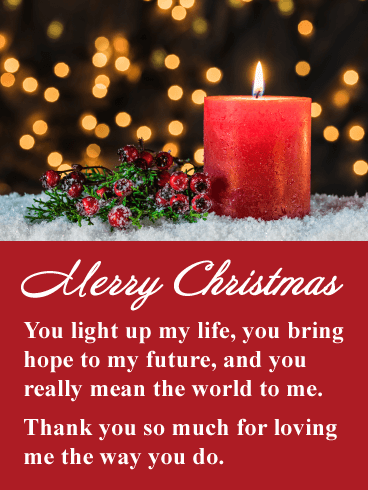 When you need an elegant holiday greeting, this glowing red Christmas card is the one to choose. 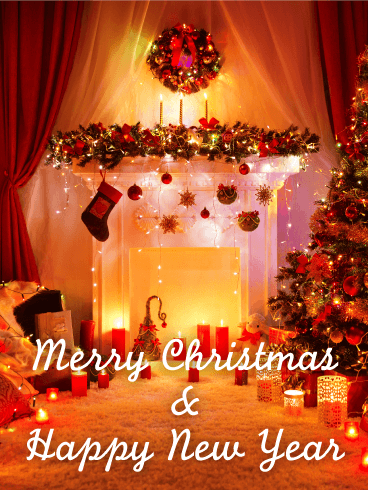 Let the bright red background and glimmering stars shine with the Christmas spirit! Shimmering white and gold snowflakes glow like Christmas lights as they fall gently through the background. 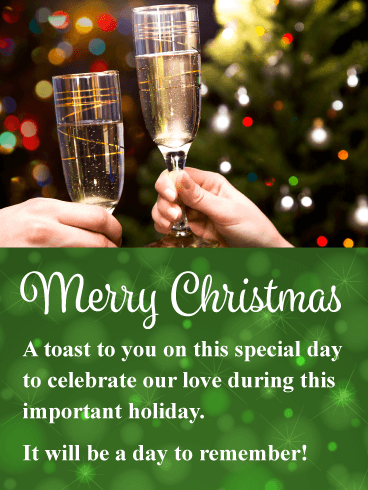 Your coworkers, friends, and family will love the beauty of this sophisticated Merry Christmas message. Can you smell the turkey roasting? Is your mouth watering for a piece of pumpkin pie? Do you have an irresistible urge to wear a pilgrim's hat? 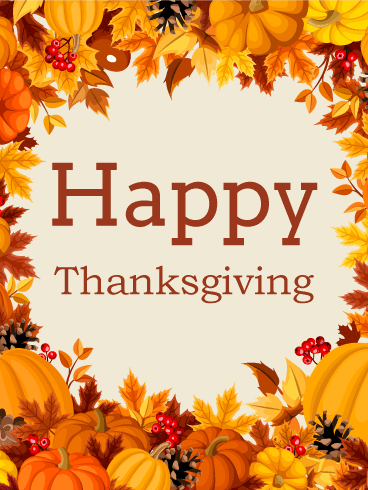 We look forward to the Thanksgiving feast all year long! 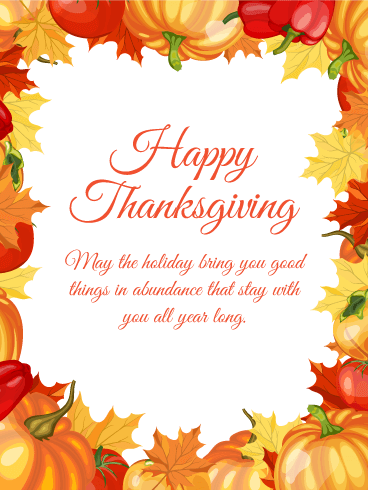 The time to give thanks is here. Send this Thanksgiving card today. It's perfect for friends, family or co-workers. 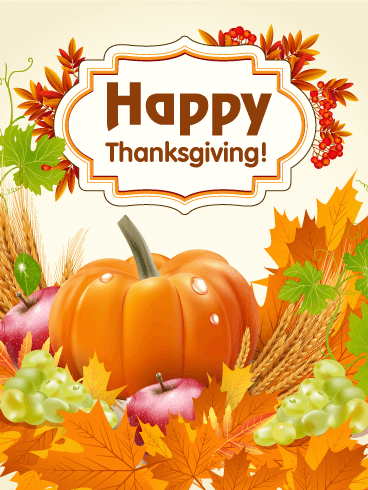 Give thanks and celebrate the season with this special turkey day card. 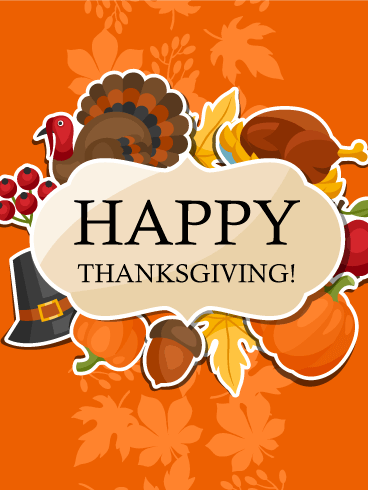 When we think Thanksgiving, we think family, friends and food! We gather around the table to fill our hearts with gratitude, and our bellies with goodness. This Thanksgiving card beams with the light of the setting sun accenting a basket that represents the plentiful harvest and abundance in our lives. 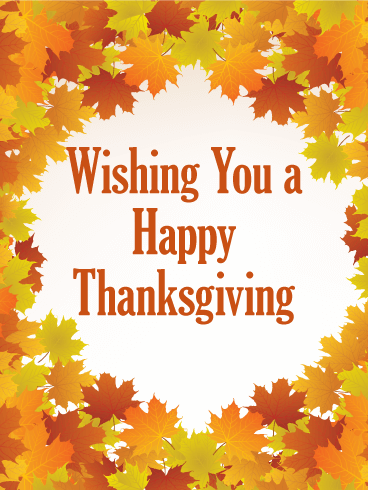 Wish someone a Happy Thanksgiving and send a reminder that yummy food, laughter and good cheer is on the horizon. Our hearts are a harvest of gratitude this holiday season. 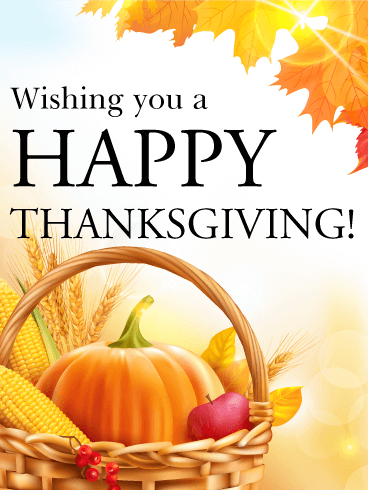 This Thanksgiving card offers a simple and sincere message amidst the beautiful and abundant harvest. You can almost smell the pumpkin pies baking in the oven and the apple cider bubbling on the stove.